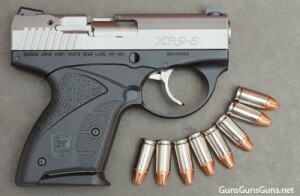 Summary: The description, specs, photo, pricing and user ratings for the Boberg Arms XR9-S pistol. Boberg Arms‘ XR9-S pistol (the “S” stands for Shorty) is a subcompact, double-action-only semiauto pistol built on a 7075-T6 aluminum alloy frame and chambered in 9mm (it can handle +P rounds). The company says the XR9-S is designed to duplicated the Glock 26’s ballistics in a smaller form factor. black Zytel polymer grips (red or green are optional). Available slide finishes include matte black and nickel/chrome satin. Available frame finishes include black hardcoat anodized and nickel/chrome satin. Options include tritium night sights and a short-stroke trigger. This entry was posted in $751-$1,000, 9mm, Boberg Arms, Semiauto, Subcompact on November 21, 2011 by Staff.